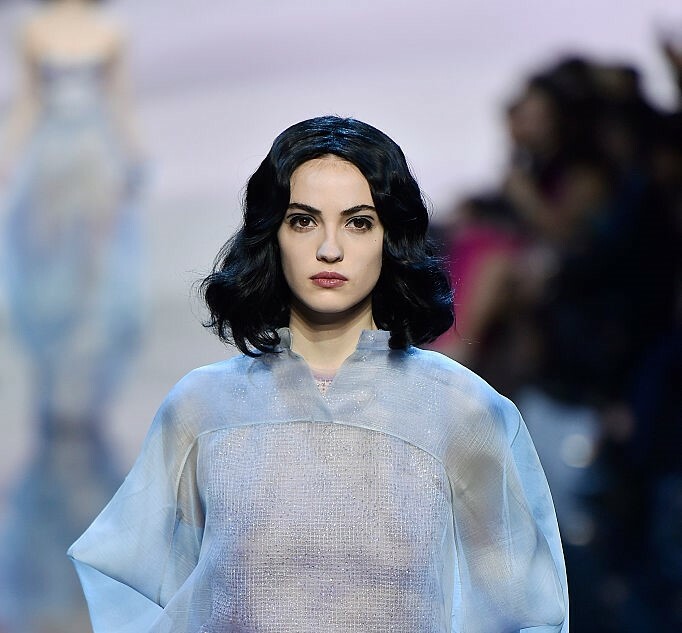 Armani Prive SS 2016 represented on Tuesday in Pairs is the recent fashion show with the smart evening looks and dresses which make us fall in love with the tenderness of raven-haired ladies. The lavish and graceful outfits in astounding and ethereal shades work quite well with dark hairstyles. It seems as if the designer has reasonably chosen black medium wavy hairstyles to bring out the charm of pastel, lavender and silver hues of subtle outfits. Everything was combined fantastically and harmoniously. If were not those stunning jet black hairstyles perhaps the looks wouldn’t have been so eye-catching and elaborate. Their loose and relaxed shapes with a bit volume showcase the natural beauty of black hair. Both cool and dark skinned ladies were sparkling in these slightly wavy hairstyles. It is more than obvious that this hairstyle is an easy to do yet so luxurious and sophisticated one. It is a trendy mid-length wavy style which you can achieve on medium bob or fresh lob haircuts. How to Style: Let’s start from the haircut and hair color. If you want to get this perfectly festive hairstyle you should first of all, go for a medium haircut. It will refresh your tresses and will bring more thicker-looking effect. So, say goodbye to long strands and enjoy the elegance of the cozy mid-length. Once you are done with the haircut pass on to the hair color. No matter you are a natural blonde, brunette or redhead, if you want to change your shade into a dark one you will surely find the most suitable hair color. Consult with your hair colorist to make sure the glossy jet black is for you. Take into account your complexion and eye hue. Luckily jet black works with many skin tones and compliments dark eyes. It beautifully brings out light eye hues. So, dye your locks in this fresh, trendy and shiny hue. Now, the hairstyle! What do you need to have to create this hot feminine hairdo? First wash hair with hair color protective shampoo and apply conditioner. Then blow dry hair to bring some volume. Tease the top, center part it, rub hair cream, make sleek and comb gently. After you are done with the desired shiny effect, apply hair cream and use hair curling iron to get loose waves from the middle part to the ends. Then leave waves down and spray light hair spray. Enjoy your own delightful hairstyle in front of the mirror. This is the elaborate hairstyle from Giorgio Armani Prive SS 2016.